Like the Walker Brothers in the 60s, Blondie initially found greater fame in the UK than their native America. Their first UK hit was a cover of Randy & The Rainbows’ 1963 song Denise which Blondie altered to Denis (Denee) went to number two here and they followed it with (I’m Always Touched By Your) Presence Dear (number 10), Picture This (number 12) and Hanging On The Telephone (number five) all of which were in 1978. Then, cashing in on the disco scene, they had their first UK number and debut American hit with Heart of Glass. Blondie’s guitarist and songwriter Chris Stein was born in Brooklyn and in the early seventies he joined the glam-rock group the Stilettos, which featured New York-born Deborah Harry as its lead singer. After the Stilettos fell apart, Stein and Harry formed Blondie. Heart of Glass, like the two previous hits, was produced by Mike Chapman who had made his name as producer and co-songwriter with Nicky Chinn, on many hits by Mud, Suzi Quatro and The Sweet. “We weren’t prepared for this level of expertise so we learned an enormous amount how to record from him,” recalled Debbie Harry whilst they were recording the multi-million selling album Parallel Lines. The fourth and final single from the album was Sunday Girl. It followed Heart of Glass to number one and also did likewise in Australia but not in the States where it was not released as a single. The song was written by Debbie’s boyfriend Chris Stein. “I wrote that song to cheer Debbie up because she was down as her gray cat named Sunday Man had run away whilst we were away on tour.” Blondie’s drummer Clem Burke came up with a unique drum pattern which he had showcased on Hanging on the Telephone and used the same pattern for Sunday Girl. There was tension mounting among the band so much so that when it came to designing the cover of Parallel Lines, their manager, Peter Leeds was forced to come up with an idea to shoot the sleeve without the members being together. He explained, “I knew I couldn’t put them in a photo session together and get a usable photo, so I came up with the idea that each of them had their own black or white stripe so that we could take the pictures individually.” The song, Parallel Lines, which was about communications, was never completed. 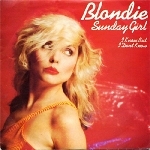 The sales of Sunday Girl were boosted by the 12″ single version that featured a previously unavailable track on the B-side which was a French language version of the A side. That version also appeared in the cassette version of their next album Eat To The Beat. The more hits Blondie had, the more the media focused on Debbie Harry, which led to an increasing amount of exposure on the front cover of a variety of magazines. The majority of which found their way on to the walls of every male teenagers’ bedroom. She was the Marilyn Monroe of the punk era. In 2010 a cover version by British singer Florrie was used in the Nina Ricci perfume television commercial. Blondie re-recorded the song and offered it to be included in the CBGB’s film soundtrack. It was also included on their 2014 two-disc compilation album Blondie 4(0) Ever which was packaged with their 10th studio album Ghosts of Download and marked the 40th anniversary of the forming of the band. At the time of that release Debbie Harry did a series of interviews where she defended today’s teen idols such as Rihanna and Miley Cyrus, who have been criticised for their risqué performances on stage. “I was criticised for being too overtly sexual, which was very innocent compared to what is going on now,” she said. “I think they’re entitled to do what they feel or what they think is going to work for them. And I think they look good. It seems part of the standard for today really,” she added in a radio interview in Germany.